All major topics in Networking are covered thoroughly. Each topic is explained in details. Even complex topics have been made easy to understand. Videos and Animation included which makes understanding of theory topics better and easy. Entire theory part can be read using text to speech facility. 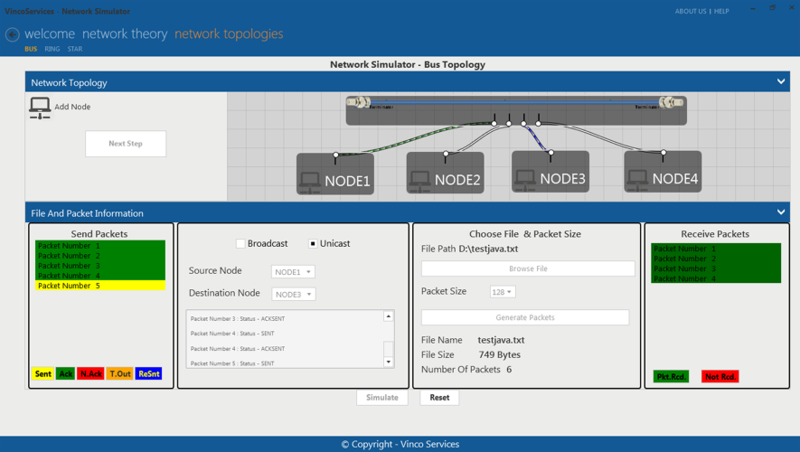 Various Networking Components can be simulated easily. Facility to create user defined Networks. Simulation of functioning of created Networks. Measurement of Various Network parameters. Various Experiments can be performed with different combinations. Drag and drop facility to add Nodes to Network. Any numbers of Nodes can be added. Experiments of Ring Topology with options to select packet delay, token delay, Source Node, Destination node and first Node etc. Study of data size Vs normalized throughput. Simulate Ring Topology with various protocols viz Stop N Wait, Go back to N, Selective repeat. Note: Specifications of any product can be changed or added without notice in our constant efforts for improvement.